The Parish Church dominates the skyline of Llantrisant and is found just off the Bull Ring (Swan Street)in the historic part the town. The Church is dedicated to three saints: Illtyd, Gwynno and Dyfodwg. 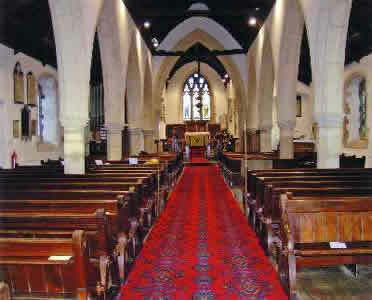 The site of Llantrisant Parish Church has been used for Christian worship for over 1300 years and the present building was built by the Earl of Glamorgan, Hugh de Spencer. The Church building, listed by Cadw, was rebuilt in Norman style around 1246 and underwent two further major restorations in the nineteenth century. A great deal of additional work has also been carried out since 1963. Most recently work has involved the repointing of the tower, restoring the tiled roof to its medieval appearance, and the very recent installation of a major new heating system. Within the building itself there are a number of points of interest. 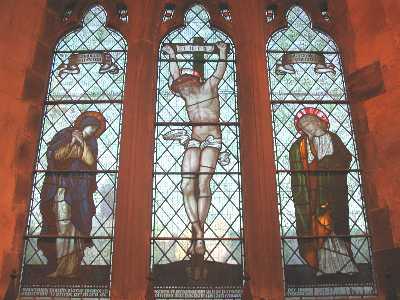 The east Window behind the altar features a stained glass picture of the Crucifixion depicting a beardless Christ.